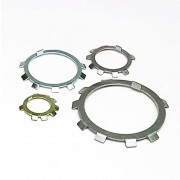 Tooth locking washers with teeth that are twisted to grip and extend radially outwards, external or inwards, internal to bite into the bearing surface. 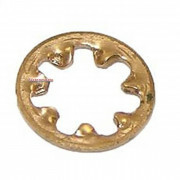 This type of washer is especially effective as a lock washer when used with a soft substrate, such as aluminium or plastic, and can resist rotation more than a plain washer on hard surfaces, as the tension between washer and the surface is applied over a much smaller area. The external style has the serrations around the outer edge, which provides better holding power, because of the greater circumference area.